We don't know much more about Egan and Earlscliffe, but we do know that there were legal dealings with Egan and his executors and William McDougall of Drumleck, Howth (see map above). Egan also owned St Lawrence House in Howth from at least 1852 until his death on 2nd July 1863. St Lawrence House was later converted into a hotel, which closed in the summer of 2000 and is now an apartment complex. Egan is buried at St. Fintan's cemetery, Sutton. In terms of Earlscliffe, we are uncertain as to whether Egan owned it until it was sold in 1864 as we only have evidence that he owned it up to 1850 . However, I am still researching this, so watch this space! It is not known exactly who bought the house in 1878, but as Earlscliffe was owned by Dawson Thomas Knox in 1881, it is assumed that he bought the house from the McClintock-Bunburys three years earlier. We don't know anymore about Dawson Thomas, but the house also seems to be linked to various other members of the Knox family at that time including Ellis Henry Knox , Cheney John Maunsel,  and Commander Vesey Knox, RN! Ellis Henry Knox was a Clerk in the Office of Commissioners of Church Temporalities in Ireland. We don't know any more about Ellis Henry, except that Emily Knox, his half sister and a Professor of Music , lived at another house nearby on Ceanchor Road (Couleen) until she died on 19 Feb 1952 aged 76. The following links display scrollable timelines related to Earlscliffe residents, showing births, marriages, deaths and major events in their lives and in their home and working environments. A sale notice for Earlscliffe in the Irish Times July 6 1895 mentions that it is "held as to part for 143 years from 1st November 1844, under a lease dated 15th December 1847, and a reversionary lease dated 1st May 1895..."
 From the Lisnavagh Archives (G 8/12). As relayed to me by Turtle Bunbury in July 2009. As an aside, a later owner of Earlscliffe, John Pentland Mahaffy, married the daughter of William McDougall in 1865.
 http://www.turtlebunbury.com/family/bunburyfamily_lisnavagh/CaptainWillMcCB/bunburyfamily_lisnavagh_captainwill18521866.html . Turtle Bunbury, a descendent of the Captain's family, has confirmed that Pauline Stronge died in 1876. This fits in with the entry in  above which states that the last date that she is known to have lived at Earlscliffe was in that year. It is also confirmed in the Wills and Administrations entry here: http://www.willcalendars.nationalarchives.ie/reels/cwa/005014892/005014892_00046.pdf which states that she died on the 1st Jan 1876. Debrett's Peerage Page 521 https://books.google.ie/books?id=GdsNAAAAQAAJ&q=%22ellis+Henry%22+earlscliffe&dq=%22ellis+Henry%22+earlscliffe&hl=en&sa=X&redir_esc=y with an entry that reads: "Ellis Henry, b. 1842; is a Clerk in Office of Commissioners of Church Temporalities in Ireland. Residence, — Earlscliffe, Howth, co. Dublin"
 Thom's Irish Almanac & Official Directory~1886, as listed in "Extracts From Various Trade Directories 1834 To 1910" http://freepages.genealogy.rootsweb.ancestry.com/~chrisu/howth/howth_dir3.htm It states that a D Knox lived there. This is Dawson Thomas. The dates listed were 1886, 1891 and 1892. Also, various Irish Times notices seem to indicate that a C Knox lived here. Could that be Cheney? The story of Emily was originally told by Olive Stanley Clarke to David Robinson in the 1980s. However, there are some interesting facts about the Knox household at Couleen. 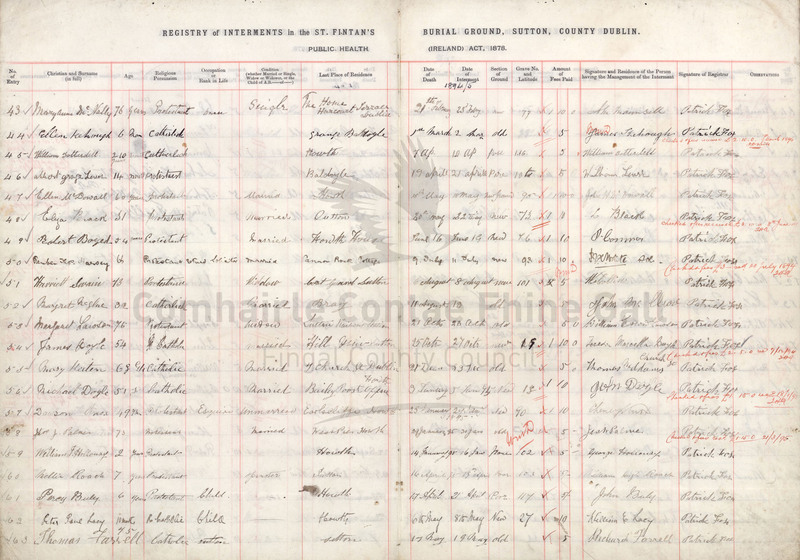 The 1911 census shows that Cheney John Maunsel Knox (Ellis Henry's brother) lived in 9 Percy Place in Dublin with his sister Emily Knox and they had a servant called Kate Cassidy (from the 1911 Census found http://www.census.nationalarchives.ie/reels/nai000127524/ on3rd Oct 2015). Certainly Kate died in Couleen on the 15th Sept 1947. See also the England & Wales, National Probate Calendar (Index of Wills and Administrations), 1858-1966. The house was advertised in the Irish Times July 6 1895 pg 9. Earlscliffe was described as a "first class Residence, in perfect order, with every residential attraction, situated on the sunny side of Howth, facing Kingstown, and adjoining the sea shore, standing upon about five acres. Immediate possession." It also said that the "climate on the south slope of Howth is well know for salubrity, being well protected from north and east winds. Earlscliffe occupies the choicest position on the south slope of Howth, the most enviable marine residential position in the County of Dublin." As reported in the Worcester Journal, 5th November 1853. Griffith's Valuation 1848 and 1850 show that Egan occupied houses and land marked as 2a and 2b on the map, where 2b is shown as Earlscliffe House and lands. (On the maps, the numbers represent a lot number. Capital letters after the subdivision number (e.g. ‘2A, B ,C’) are used to label subdivisions within a lot and indicate separate parcels of property in the townland held by the same individual. Lower case letters indicate properties). Thom's Irish Almanac & Official Directory 1852, to 1864. Thom's Official Directory of the United Kingdom of Great Britain and Ireland, 1894, Law Directory page 846. Ireland, Grand Lodge of Freemasons of Ireland Membership Registers, 1733-1923 for Dawson Thomas Knox has an entry for his death in Volume V (1860-1899) as on the 25 Jan 1895. This is confirmed in the Calendars of Wills and Administrations, 1858 http://www.willcalendars.nationalarchives.ie/reels/cwa/005014909/005014909_00233.pdf . http://thepeerage.com/p33229.htm states Dawson Thomas Knox was born on 4 May 1845. He was the son of Reverend Thomas Knox and Eliza Winckworth Bent.